DO-36225-61 was succesfully added to your cart. These temperature controllers display both the setpoint and process temperature and features modern control technology that produces greater temperature stability. The Auto-tune feature minimizes setpoint overshoot and features the ability to learn your process producing greater stability. Changing your setpoint is easily done with the interface keys. 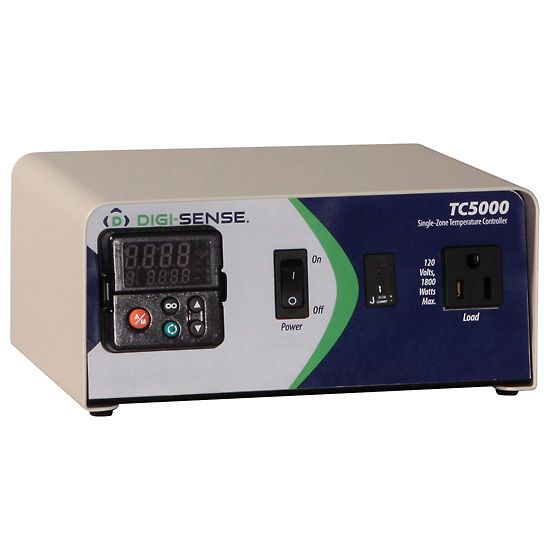 The controller can also perform ramp rate operations to allow the user to slowly raise the process temperature. The controller also features an audible alarm output, temperature selectable and one panel mounted receptacle that accept a three-prong plug. Select from models for types J, K, or T thermocouples with miniconnectors, or 100 ohm platinum RTD probes. This unit comes with a lattice support bracket, which is ideal for mounting to maximize space. The max temperature is 65°C or higher?? The actual temperature measurement range is –328 to 2192°F (–200 to 1200°C).